INDIANAPOLIS — Sunday’s on-field action at the NFL Scouting Combine in Indianapolis featured what’s considered the deepest group in the upcoming draft, the defensive linemen, as well as the linebackers. What were the top takeaways from the day? Montez Sweat is 6-feet-6-inches tall, and weighs 260 pounds. A little context for you. On Sunday, Sweat headlined a deep group of defensive linemen by running the 40-yard dash in 4.41 seconds, setting a modern NFL Scouting Combine record for his position group. A little more context? A 4.41 40-yard dash would make Sweat, who had 22.5 sacks and 30 tackles for loss in two seasons as Mississippi State, the eighth-fastest wide receiver at this year’s Combine. "That's a tank,” the NFL Network’s Daniel Jeremiah said. “That's not normal." Want more? Quinnen Williams out of Alabama is 6-foot-3 and 303 pounds. On Sunday, he ran the 40-yard dash in 4.83 seconds, the fastest time for a 300-pound defensive lineman at the Combine since 2012, according to NFL Next Gen Stats. These guys just seem to get bigger, faster, stronger every year. Another key defensive lineman to show out well on Sunday was Ohio State’s Nick Bosa, who was held out of most of the 2018 season with an injury but was able to get back in time to run drills at the Combine. Bosa, who is in the conversation to be the No. 1-overall pick and is a relentless pass rusher, ran the 40-yard dash in 4.79 seconds. “He's the best player in the draft in my opinion. … I think he's as skilled of a pass rusher as we've seen in a while,” Jeremiah said. “He's not the physical freak that we've seen from Myles Garrett and Jadeveon Clowney. He's not in that class. “But, when the tape starts, you put it on, he's unblockable." Next up on the field Sunday were the linebackers, where it was the Day of the Devins: LSU’s Devin White and Michigan’s Devin Bush. White showed off his athleticism with an incredibly fast 40-yard dash time of 4.42 seconds, and then he hopped 39.5 inches on his vertical for good measure. Bush, meanwhile, was beat out by White by literally a hair in the 40-yard dash (4.43 seconds), but the 5-11, 234-pound bruiser had an impressive 40.5-inch vertical, 124-inch broad jump and 6.93-second 3-cone drill. While the linebacker position as a whole isn’t considered especially deep this year, there is a third talented player at the position who’s easily considered a first-round talent: Josh Allen out of Kentucky. A first-team All-American, Allen, who can play out in space and rush the passer, confirmed his status as a projected Top-5 pick, running the 40-yard dash in 4.63 seconds and looking smooth in field drills. "He's a great player. He's my third overall player,” Jeremiah said. “[He] stands up an outside linebacker ... [he had] all kinds of production this year at Kentucky covering tight ends." 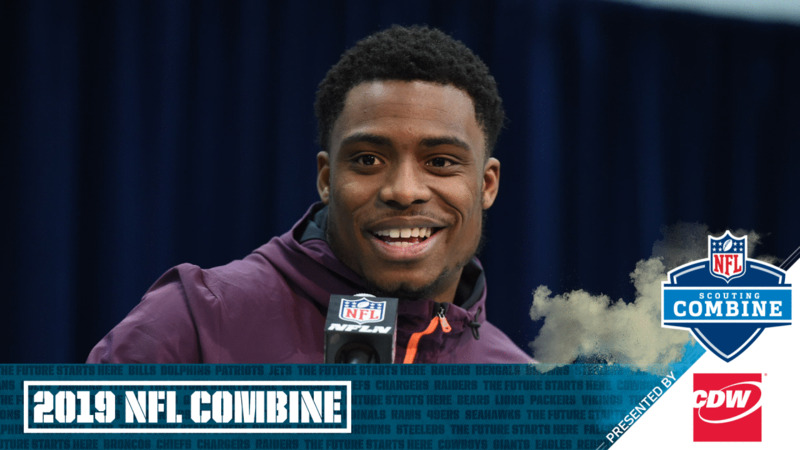 Sunday also represented the final day of media availability for the Combine prospects, with the defensive backs taking their turn at the microphones at the Indiana Convention Center. And, as defensive backs tend to do, they had plenty to say on Sunday. Take Florida’s Chauncey Gardner-Johnson, for example, who told us that he considers himself “the most versatile DB in this draft.” Colts.com’s Jake Arthur writes that Gardner-Johnson’s tape seems to back up his talk. Then there was a guy like Georgia cornerback Deandre Baker, who said he wakes up thinking about shutting down an opposing team’s best wide receiver. "Week in and week out, I want to face the best receiver. I get up and that's the first thing on my mind, facing the best receiver," Baker said. "I want to show my talent, he wants to show he's talented. Just man on man, that's what I like to do." We also profiled Baker’s game tape, which you can see by clicking here. Monday is the final day of action at the 2019 NFL Scouting Combine, as the defensive backs hit the Lucas Oil Stadium turf for drills. We’ll, of course, have full coverage on Colts.com. Here is a look at the defensive backs talking to the media at the 2019 NFL Combine.